Hourglass products have been a staple in my collection for a long time. While I haven't been the biggest fan of their foundations (their Immaculate Liquid Powder Foundation looked too dry and powdery on my skin), their Ambient Lighting Powders and Veil Mineral Primer make for great accomplices to an airbrush finish. So when I was given the opportunity by both Influenster and Hourglass to try out their latest and greatest from the line, I jumped at the chance. The Hourglass Vanish Seamless Finish Foundation Stick is a creamy consistency foundation in stick form. 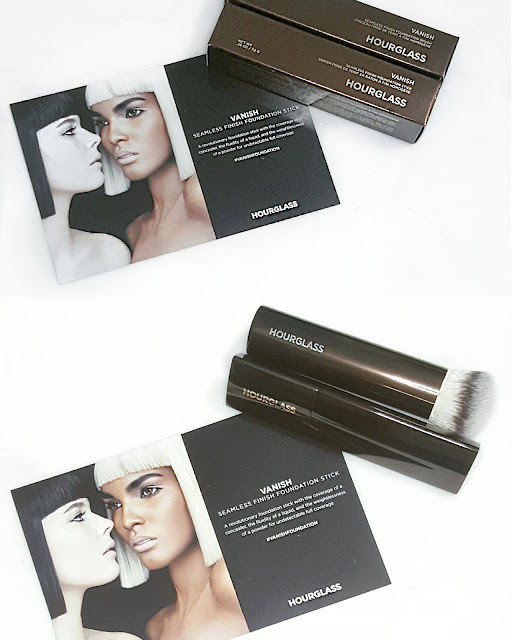 It is currently available at Sephora in 26 shades for $46 and was created to be used in conjunction with the Vanish Foundation Brush (sold separately for $46), which is similar to a dense, round-top kabuki brush. 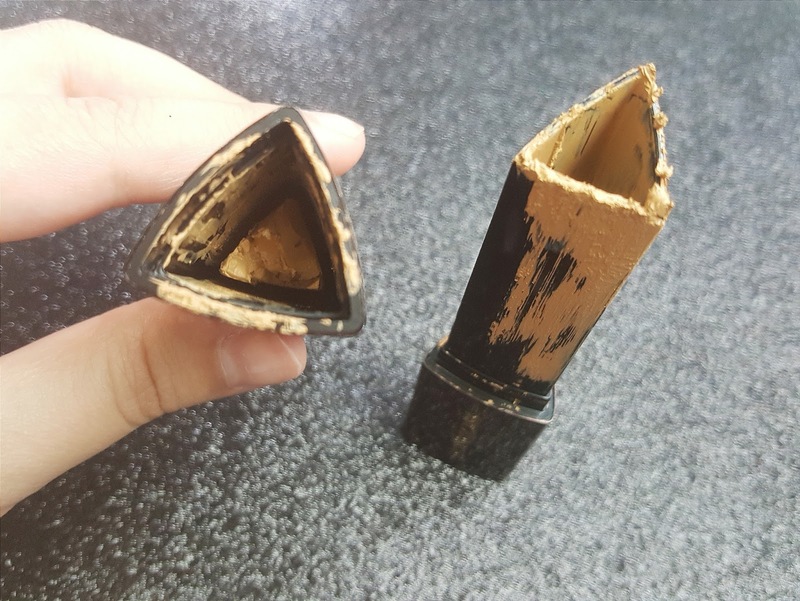 Here are the claims made about this product straight from the Hourglass website: "A revolutionary foundation stick with the coverage of a concealer, the fluidity of a liquid, and the weightlessness of a powder in a longwearing waterproof formula for undetectable full coverage. 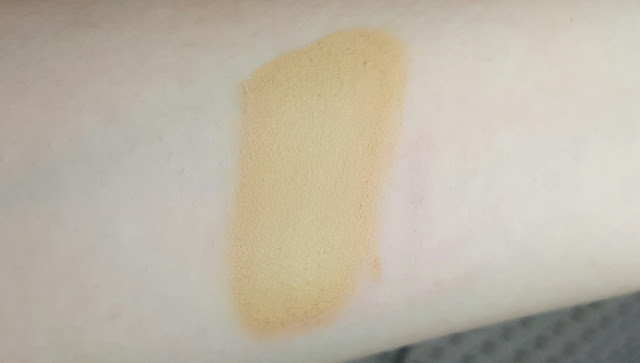 The unprecedented concentration of pigment in this foundation provides maximum coverage with minimum product, concealing all discoloration and imperfections for flawless skin with a seamless finish." 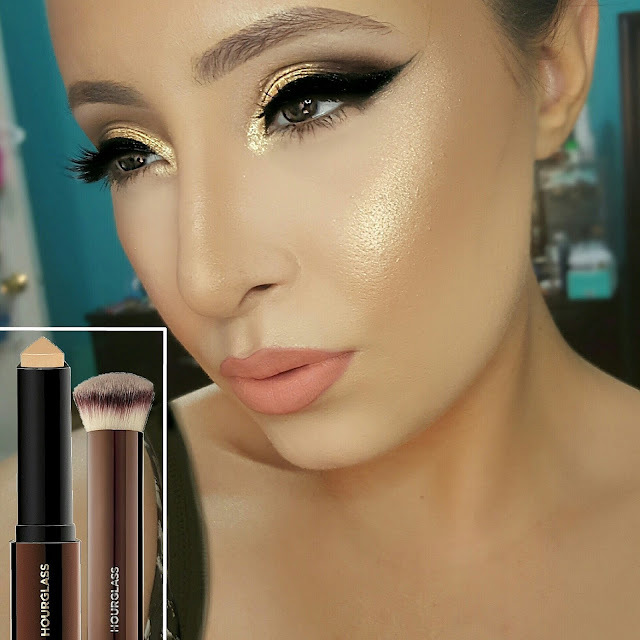 As mentioned before, a foundation brush was created with this foundation's formula in mind. Also, the information card sent with the products specified that prepping the face with the Mineral Veil Primer would be optimal, so both the use of the brush and the priming of my skin with this specific primer were the basis of my application. Unfortunately, my foundation in the shade Sand was broken in transit, so applying the foundation stick straight to my face as I normally would was out of the question. Instead, I scooped a small amount out with my stainless steel makeup spatula and striped it onto my face with my finger. I believe the warmth of my hand in this initial application helped to soften this very thick formula enough so that when I used the Vanish Foundation Brush to buff it out, it blended out seamlessly. You could apply it using your beauty blender, but the thick consistency might create a patchy situation and sheer out the full coverage. Once applied, the foundation had a full coverage, natural satin finish to it, which I thought was absolutely beautiful. If you're familiar with my reviews, then you probably already know that I tend to wear my makeup for long periods of time that works out when testing the true longevity of foundations, especially ones that boast to be long-wearing and waterproof. In this case, I wore the Hourglass Seamless Foundation for over 12 hours and felt that it held up pretty well. It did not break down or get cakey by any means, but gave a healthy, dewy glow to my skin despite using the Mineral Veil Primer (an oil-controlling primer) and putting it to the test on a relatively cool day. On all accounts, I'm still an eyeshadow junkie, but I can definitely say that this year has been the year for testing out face products for me. And while I have found some bases that were disappointing and even more that I liked, rarely have I found one that I am absolutely head over heels for. Despite getting dewy after a few hours, the Hourglass Vanish Seamless Foundation remained beautiful throughout--never fading, getting patchy, or cakey. It was very radiant and skin-like. However, while I find the glow to be beautiful, I understand that this may raise some alarms for those of you that are very oily, so I recommend prepping your skin well with a gel-based moisturizer and mattifying primer as well as setting the entire face well with a powder. Otherwise, this foundation will be wonderful for those with dry, normal, and even combination skin. To point out one more negative, I was slightly disappointed in the shade range. My shade, Sand, was 12th in the line-up of 26 and by no means should I be considered anywhere near the median; if anything I fall into the light category. The line does in fact reach deeper complexions, but whether the undertones are actually suitable for those in that category is left up to debate. Overall, if you're in the market for a highend full coverage foundation, this one should definitely be on your list of ones to try. *The products in this post were sent to me for review, but all opinions are my own.